Dhrupad vocal practice could became a meditation technique to stay in touch with ourselves. Deep listening brings us the benefits of a meditative practice. At the same time, the body awareness needed for vocal production brings us knowledge about our physical body and its possibilities as a container or instrument for our soul. What we will do during the sessions? Learning Dhrupad we will learn how to listen better, reducing the gap between what it is and what we could perceive. Apart from the regular meetings, we are planning to offer different activities with guest teachers. These meetings will take place approximately one weekend to the quarter and will be open to everyone. These sessions are considered as a complement to weekly work to go deep in our learning process but also as a meeting point with other Dhrupad students. If we are enough people, we could also plan to organize an intensive of more days during the holidays of Christmas, Easter or summertime. Dhrupad is one of the musical genres of Indian music. During the 15th century, it had a devotional purpose, linked to the Vishnu worship, although soon became the court music of the Hindus and Mughals until the nineteenth century. Over the last 50 years the genre has undergone a very important revitalization thanks to the last generations of musicians like the Dagar Brothers, Pt. Vidur Mallick, Z. Mohiuddin Dagar, Z. Fariddudin Dagar, R. Sanyal, Gundecha Brothers and Udai Bhawalkar, among others who have believed in the importance to explore deeply the dimension of sound and rāga music as well as spreading this tradition, both in India and all over the world through teaching and performing. Dhrupad, specially that which come from Dagar Gharana, make focus in accurate intonation and long and sustained notes in the extended and improvised sections of ālāp, jod and jhala are one of the main features. It is used an specific vocabulary of syllables that alows to maintain the continuity of sound. During the last six years I have studied a degree of Indian Music Tradition at the Conservatory of Vicenza where singing Dhrupad, with the professor Amelia Cuni, was the main subject. In 2016 I was awarded with an ICCR scholarship to go to Bhopal, India, to study one year postgraduate with the Gundecha brothers at their Institute. During this year I was able to deepen into the understanding and practice of singing this genre, living in their residential school – gurukul – with daily classes and regular sessions for individual and group practice. 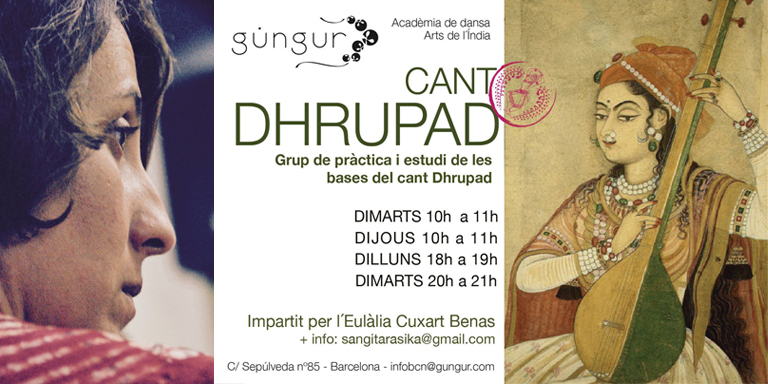 Throughout these years I have started the Saṅgītarasikā Musical Experiences, a project for the knowledge of Dhrupad singing and Indian music in Catalonia and Spain, organizing experiences such as seminars and concerts, collaborating with various artists and groups. The idea of creating and directing a group practice is born from the will to share the study and practice of singing Dhrupad with people from the same city and its surroundings. This group is open to all kinds of people interested in vocal work, meditation through sound, music in general and rāga music in particular. The purpose of this group is to create a space for weekly practice, an appointment for shared artistic training. As it is a group for practice, the idea is to start with a stable programming that I personally direct and, depending on the dynamics of the group, we would find together new ways to work.